Said in a classic patronising tone to Moo, while I was away. Great: you've got to love 3 (nearly 4) year olds. The girls are great at the moment, they really are. I'm off to the 1030 at White Colne tomorrow, the only church in the team that I've yet to visit. Watched Body of Lies on the plane: it's OK, but a little obvious. Got in OK, having got some sleep during the flight, and ended up not sleeping in the car on the way back (and no, I wasn't driving). Both girls were very, very pleased to see me, as I was them - and Moo, of course. We took them to an indoor play centre in the afternoon, and it was lovely to have some family time for a change. All though I'm pleased to be home, and pleased to be with Moo and the girls, I'm most pleased that I can take some of the burden off Moo's shoulders: she's had a terrible week, and just needs someone else around. I finished off most of the work I'd planned to do, and had a - at times heated - wrap-up meeting. It was then time to bid goodbye to colleagues and friends that I've got to know over the past two - nearly three - years, with nary a clue as to whether I'll ever see them again. Quite a few of us will certainly keep in touch, but it's quite possible that I'll never come over to Toronto again on business, even if we do get taken over by Verisign, and they decide to keep me. It's very odd, and rather unsettling. There are quite a few people I'll really miss if that's the case. I'm currently sitting in the Air Canada lounge, bringing my blog entries up-to-date, and wishing that I'd been around to help Moo, who's had a terrible week of it: the girls have been ill, she's had little sleep, and her work has been, well, difficult. I'll be back tomorrow, and hope to pick up some of the slack. Snow. Snow. And more snow. (backposting) It snowed overnight. Proper snow. There had been snow on the ground - mostly piled out of the way - when I arrived on Monday, but there were several centimetres deposited - and in places drifted - overnight, and it snowed pretty much all day. I _did_ take my coat, and drove very carefully to the office, which is only a mile or so from the hotel, there to find only about half of the people having made it in, for which I really couldn't blame them. (backposting) Today it was around -10C to -15C, which is pretty chilly. But not _that_ cold. I didn't bring my coat into the office, and didn't need it: all I was doing was walking to the car, driving it, parking it, walking to the office, walking across to the next building for lunch, etc.. You get the message. A number of Canadians - who really ought to be used to it - didn't get it at all. To Canada - one last time? (backposting) I took an earlier plane than usual, to maximise the time I'd have in the office in Mississauga, but that meant getting up at 0550. Luckily (or not), Jo was already in with me by then, so no matter. It was sad saying goodbye to Moo and the girls, and weird knowing that this may be my last time to our HQ in Canada, as it really looks like work is going to be acquired in a friendly take-over by Verisign. That's OK, but it's completely impossible to know if they're going to want me afterwards. Wasn't feeling great, but took something, and felt OK by the time I got to Heathrow: a sleep in the car helped (I wasn't driving). An OK flight (I watched Ghost Town, which was funny and sentimental in about equal measure), and got in a little before 1500. Picked up a car, and was at the office by 1530. There's lots of work to be done, and some politics to negotiate, but that's all part of the fun. I got done for the day around 1730, and headed to the hotel, and then on to Square One, where I managed to buy some clothes for the girls as presents. Back to the hotel, which was heaving, so I went and had food at a local Kelsey's. Not great cuisine, but it filled the gaping hole in my stomach. And then to bed. (backposting) Sleep? Not so you'd notice. Didn't need a daughter in with me for much of the night, but Moo had the other one (Miri), so that's the way it goes. But - I was preaching. And singing - "The Three Kings" by Peter Cornelius. So, got it together enough for both of those. I preached on unemployment and redundancy, tying it in to the fact that for many of the people mentioned in the New Testament, (though not, as it happens, for Ananias, who plays an important role in the story of the Conversion of St Paul, which we were celebrating today), we know what their job was: carpenter, tent-maker, fisherman, taxman, and maybe even prostitute. We're often defined - or define ourselves - in terms of our jobs. And that everyone in the congregation will, within the next year, know someone who's lost their job, or been affected by redundancy. Now, God doesn't call us because we're tax-collectors, or carpenters, or IT managers or secretaries, but because of who we are. Not that I want to tell people who are affected by redundancy that it doesn't matter, and to worry about being called by God, because it's the place of everyone to emulate the saints and reach out. Jesus talked about caring for the sick, the imprisoned, but he didn't talk about caring for the jobless. I think that these days, he is. Not well yesterday, not well today. Seemed to be getting a bit better, so we agreed that we'd all go to Sudbury shopping this afternoon (rather than just me and Jo: you should have seen Miri's shoulders' slump), and then she threw up in the car. Yeuch. And then Jo decided that she needed a wee at the roadside, and that turned into a poo. By the time everyone was finished, we decided we might as well complete the trip to Sudbury, and I stayed in the car with Miri (who we'd stripped off and wiped down, to be fair), and Moo took to the marvellous Rafi's (or "Spicebox", as it's officially known), and got some curries. And we had a chicken xacutti tonight. Yum. Jo's really, really pushing it at the moment. Oh, and I realised this evening that I'm down to preach tomorrow at the 1000 at Halstead. We're commemorating the Conversion of St Paul, and I'll be talking about redundancy. Not exactly coordinated, but we're having fun. I was going to blog about my trip to Canada next month, or about being in Eindhoven today, or how work has suddenly got a _lot_ more interesting. But today is a day of history, and, like most of the blogosphere, I suspect, I can't avoid talking about that. Hopefully, my two daughters watched at least some of the inauguration. Jo, at nearly 4, is too young to realise the importance of what has happened today, and Miri, at nearly 2, will have to be told that she was sat in front of it. What's more, I didn't want to explain to Jo why having a black man as President of the United States is such an important thing: she has maybe a few more months or years without understanding prejudice, and I'd like her to have those while she can. But it _is_ a big day, and I know I wasn't alone in wondering if Obama would survive to be sworn in. He has been, and he now faces one of the greatest challenges any American has ever faced. God be with him. I was driving to Frankie's baptism today, and came across a diversion - which nearly took me to Husborne Crawley, as it happens. As I went past it in the other direction, I suddenly realised that I was wearing my clerical collar, and I had to offer my services. I can't yet provide last rites - not until I'm ordained priest, and I'm only a deacon at the moment - but I could offer prayer and support for anyone who needed it. So, I went back, and was waved through when I offered to help. There was a fatality - who'd already been moved - and noone else involved, so in the end, I wasn't needed, but I was ready, and I think that's the important thing. The residential was supposed to last through till Sunday, but it's my nephew Frankie's baptism tomorrow, and I decided to come home first, and then drive over tomorrow morning. Made a new friend on the course, I think: Will, who wasn't at our pre-ordination retreat. From a very different tradition, but an interesting guy, and we had some interesting chats. I also finished Catholicism by Jean de Lubac, about which I've posted previously. I very much enjoyed parts of it, and I'm happy to accept his general views on Catholicism, but not the low-level premise that the Roman Catholic Church is the sole guardian of the Catholic Faith and the true Body of Christ. Learnt a new word, as well: "circumincession", which seems basically to be the same as "perichoresis", but in Greek. (backposting) Off to a CME residential this afternoon, after a day getting some good stuff done for work. So good to see lots of friends for the first time in a while. Went out to the pub afterwards, which is always fun. I had a supervision with John, my incumbent, today. It was a six-month review, and I think we're both pretty happy with how things are going. This is great news, because it took some real compromise and pain when we were setting up the agreements. Also, we've got through more of the pieces in the training agreement than I think either of us had expected, which is quite a relief. Not to say there's not a lot more to do - there is - but it's going well. This evening, I attended choir practice, as we'll be performing Cornelius' "Three Kings" on the 25th, as part of the 1000 service. We found a good place to sing from, with really nice acoustics. The choir did well, as they'd only had one chance to look at it before. I cooked a rabbit yesterday. Yum, though a little more dissect than I'd like. I made a nice stew or casserole. I wish I knew what the difference was. But I put in potato, broccoli, carrots, onions, beef stock, wine and my secret ingredient. And rabbit. Snaffle, snaffle, twitch, twitch, bubble, bubble, yum, yum. I was given a recommendation to read Jean de Lubac's Catholicism a few weeks ago, and I'm getting through it bit by bit. I'm enjoying it, though there's much in it with which I don't agree. Some of it I like very much, in particular de Lubac's insistence on the importance of the redemption of the entirety of the Body of Christ, the Church. But there are facets of his theology with which I disagree, and it's not just de Lubac, I think. "[O]utside the church, no salvation. Obviously it cannot mean that no one is ever saved who does not belong exteriorly to the Church ... [b]ut the explanation for which a formula has been found during the last few centuries in the distinction between the body and soul of the Church is neither sufficient nor entirely exact; for the axiom refers, more often than not, not to the soul but to the body of the Church, her social visible body. Following Innocent III's example Piux IX is more explicit: he speaks of the Roman Church." Clearly, I don't accept the position that it is only through the grace which it is the privilege and ability of the Roman Catholic Church - and only the Roman Catholic Church - to grant to its members that we can come to redemption. On the other hand, I do believe in the importance of the catholic church (note capitalisation) as the Body of Christ, and I like the role that de Lubac gives it in terms of corporate - communal - redemption. So I'm not happy in a solely "personal" redemption. But if, as Protestants, we reject the suggestion of a singular authority enshrined in the Roman Catholic Church, then we need to think about where we believe redemption sits in our relationship with God and the church. It is the question of authority and the church which interests me - fascinates me - and which I hope to study over the next few years. I also think it's vital that we address the whole question of authority and the church, particularly the Church of England. (backposting) Tonight I attended a meeting about Alpha: it was a chance for those in the area who are thinking about running Alpha courses to get together, meet each other, pray, and hear from Bethan, who works at Alpha International, and spoke very well. Afterwards, I asked Geoff if he fancied a pint, he agreed to come, we met James, invited him, and he invited John. So the four of us had a quiet pint - and lots of crisps - in the Dog Inn. It was good to chat and unwind. Preferably not in the jam and butter for the scone, though, which just horrified me. 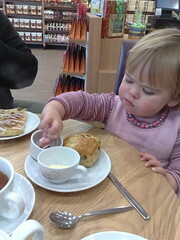 I think it's safe to say that Miri, unlike Jo, has inherited my sweet tooth. As Moo says, "there's no doubting the parentage of that one." Miri spent all day in a dressing-up ballet dress. 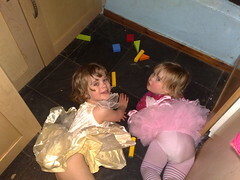 Jo did actually have ballet today, and Moo her while I stayed at home with Miri. Me: "She's at ballet with mummy." Me: "No, darling: maybe when you're a bit older." Miri: tears. Lots of tears. We had this conversation three times over the course of an hour and a half, and it was heart-breaking. 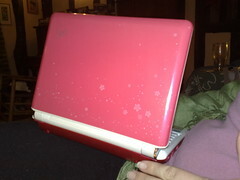 Little flowers, across the touchpad. 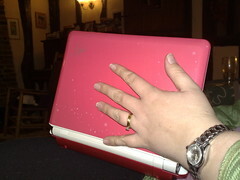 Yes, it might not have been clear what size Moo's hand is, if it weren't for the laptop in the picture, too. No - not me: Moo. 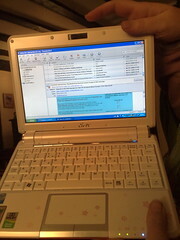 She's got herself mobile broadband from Orange, for work, and it came with a little Asus EEE 901 running XP. I've just spent some time configuring it, and it's quite a nice piece of kit. A few days ago, I finished The Life and Work of a Priest, by John Pritchard, Bishop of Oxford. I've been meaning to review it, as it's an excellent book, right up there with standard works such as Ministry in Three Dimensions, by Steven Croft. It's got a strong Anglican bias, given the authorship, but I'd say it was applicable to all those considering priesthood or ministry. I even rang up the head of ERMC, my theological college to tell him about it, and was very pleased to discover that they already recommend it to their students. It's a very realistic approach to priesthood, with real humour and humanity. I particularly liked the discussion on prayer, but most important was the realism. Pritchard knows that none of us can be perfect, and neither does he pretend that we can ever expect to be. The priests he's talking about are broken individuals who are hopefully striving to something closer to godliness. There was a little about MSEs (Ministers in Secular Employment), but I'd like to have seen more about ministers like me - those in "normal" 9-5 jobs, who have little opportunity for explicit ministry in their employment, and whose main ministry is elsewhere. Still, a very, very rewarding book, and I'd heartily recommend it to anyone involved in ministry in any way. Today I participated in my first funeral since being ordained in June last year. Taking funerals is part of ministry, and it's important that I have some experience of it. Actually, many priests/deacons who work full-time take very few, as most funerals tend to take place during the week. So, apart from families and friends, it may be that I won't be too busy with them, but I need some practice. James took the funeral, and I did a reading and intercessions. It was very, very cold in church, and I had worries not only about my ability to cope with the emotional side of the service (particularly as it was for a 53 year old mother who had died from breast cancer), but also that I wouldn't be able to talk properly because of the cold: my teeth were actually chattering. In the end, it was fine, and I found that singing the hymns helped. I wasn't able to continue to the crematorium for the committal, as I had taken an early lunch-break to be involved, but it was a very worthwhile and humbling experience. It made me realise how just being there, being a solid focus in the service, and allowing people to work through their grief, you can minister to them. That can be all it takes. Humbling, as I said. ... and ready to cook. Lovely cookies, too. We had snow here overnight. You may think you're cold, but actually you're not, unless you don't have central heating. I'm reading some de Lubac, a Catholic theologian from the the 20th century. I'm really enjoying doing some proper theological thinking again: academic theology, that is. I wouldn't in any way suggest that practical theology isn't proper, but I really enjoy the particular requirements posed by academic theology. I was suggested his book "Catholicism", which I'm reading alongside a commentary on his life and work by David Grumett, which seems interesting so far. So far, I like de Lubac's insistence on the importance of the body of the Church - its catholic nature - but am less happy about the assumption - explicit at some points, it seems, though I'm only part-way into the book - that it is the Roman Catholic church which makes up the true body of Christ, as schism from Rome puts one outside it. I need to read more, as I may be being a little harsh on the book, and I understand how much he dislikes what he sees as a Protestant preoccupation with personal salvation. I'm reading this as part of a project looking into issues of authority and the Anglican church, and it's interesting to see how it relates. I'm not sure where I'm going with it yet, but will try to keep blogging on the issue. Went to Bury today with the girls and Moo, and met Mel and her mum, Trisha. Unluckily, there's an excellent wool shop there, which Moo now knows about. We also took the girls to the cathedral, where the choir - or a choir - was rehearsing. The top line (women) were very good, though there was a rather ropey tenor around, but I realised how much I miss choral music - live choral music. I've been promising myself for ages that I'll somehow find a way to get to more services with good music, but I can't see how it's going to happen in the near future. 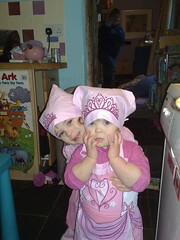 Maybe when Jo and Miri are a little older I can start taking them to cathedral services from time to time. For now, I'll just have to take what I can get. As I've mentioned in previous posts, an atheist friend and I are having a fascinating conversation about faith, which I hope to blog in time. I'm not ready to do that yet, but she asked me a particular question in a side-thread, and I think it's interesting enough to post here, as well as being separate from the main thread. It's an interesting question to be answering, and any comments on how I did it are very welcome! OK - one of the only times god actually talks to a human? These events are few and far between..........and what does he say? I am sure I am not the only one who reads the subtext "unlike you!". Then Job gets given a hard time, for no reason? Then at the end they finally have a chat. And god just goes on and on about what he has done. Not terribly inspiring? Done some reading to remind myself: never did much on the Book of Job. Anyway, it's part of what's known as the Wisdom literature in the Bible, along with several other books, of which the best known are probably Proverbs and Ecclesiastes (best known for the song "Turn, turn, turn", which quotes it). There's wisdom literature known from other cultures of the period and area, but the Bible (oddly enough!) is the best known of the set. The first point to note is that there's a particular type of writing used for Wisdom literature (or, to be more accurate, various types: various forms, to use the standard terminology). Think socratic dialogue, Greek drama, Elizabethan sonnets or experiment write-up: there are standard ways of putting these things together, and the interventions of the "3 friends" is one of those. In fact, I'm quite chuffed with my choice of socratic dialogue as an example, because I don't think that many people think that the original Socratic dialogues actually record real conversations by Socrates. The same goes for the Wisdom literature: it was a way of putting information across to the next generation(s), through a recognisable story in a recognisable structure. Now, I'm not saying that there aren't people whose experience of communication with God isn't that He/She speaks directly to them, though it's not mine. So, I guess that part of the wisdom that's being imparted is that Satan is all around us, ready to trip us up, but that if we continue resolute and trust in God, we will be rewarded in time. Part of the problem is that critical reading of the Bible, though not rare, is not what gets the press externally. It's the fundamentalists, who pretend that they read the Bible "as is" (you can't: you always bring preconceptions to all texts) who get the press, so that's who many atheists think they're up against (and who R. Dawkins, Esq. tends to engage with, to the exasperation of many of the rest of us). I hope this doesn't sound like I've ducked or side-stepped the question. It's also worth pointing out that there are many books (and parts of books) in the Bible, about which there is great academic disagreement. For instance, it seems unlikely that the story of the woman caught in adultery, told in John's gospel (the "let whoever is without sin cast the first stone" story), was in the original text, but it seems to have been added very early on in the history of the text, and to be consonant with the values of the community using it, so it tends to be an accepted part of the Canon. Oh, and don't let anyone fool you into even thinking that we (Christians) all agree on what the Bible should look like in terms of which books are in it, let alone on translation. It's all sort of fun. Really: I love this stuff! I was considering a long post about the fun we had at Si and D's last night, about how good profiteroles are for hangovers, about having a New Year's Day breakfast at Dicken's Restaurant in Halstead (full fry-up, etc. ), about how Jo managed to stay up past midnight, all that. But it took us two hours to get Jo to sleep, and I just don't have the energy.